The third-party market for iOS battery cases is on fire. That’s only a problem when meant literally. Mophie and Rocketfish have each issued recalls for specific battery case models they sell, in cooperation with the U.S. Consumer Product Safety Commission. The recalled Juice Pack Air for the fourth-generation iPod touch. Mophie is recalling its $50 Juice Pack Air for the fourth-generation iPod touch, citing a burn hazard; the case’s integrated circuit switch can overheat, which risks exposing the user to potential burns. Mophie says it has received 110 reports of the case becoming warm to the touch, 44 reports of the case becoming deformed due to heat, and nine reports of minor burns. Only cases with serial numbers beginning “TR113” through “TR120” are subject to the recall. If your case is affected by the recall, stop using it immediately, and contact Mophie at (877) 308-4581 or its recall website for instructions on receiving a replacement product. The recalled Rocketfish RF-KL12 case for the iPhone 3G/3GS. 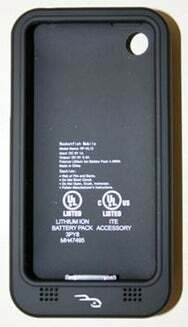 Rocketfish is recalling its Model RF-KL12 Mobile Battery Case for the iPhone 3G and 3GS, due to a fire hazard. The case can overheat while charging, leading to a fire. Customers reported 14 incidents with the case, including three reports of minor burns to consumers, and four reports of minor property damage. Case owners should immediately stop using the case, and contact Best Buy for instructions on returning the product in exchange for a $70 Best Buy gift card in the U.S. (or a $105 gift card in Canada). Best Buy can be reached at (800) 917-5737 or via its recall site.